n many of the Grail romances, the hero who visits the Grail castle is called Perceval, Parzival or something similar. In other romances, the hero is called Gawain; and in some, both Gawain and Perceval separately visit the Grail castle. In the Prose Lancelot, from which the following extract has been taken, there are five visits to the Grail castle, successively by Gawain (see below), Lancelot (who gets to know the Grail King's daughter quite well), Bors (twice) and finally by Lancelot again, who is cured of his insanity by the Grail. In this version of the Grail castle, there is no procession with a bleeding lance, only the Grail maiden bearing the mysterious vessel. J.L. Weston drew attention to the curious fact that the hall is filled with perfume only in versions where Gawain is the Quester; in this example there are many censers burning incense. 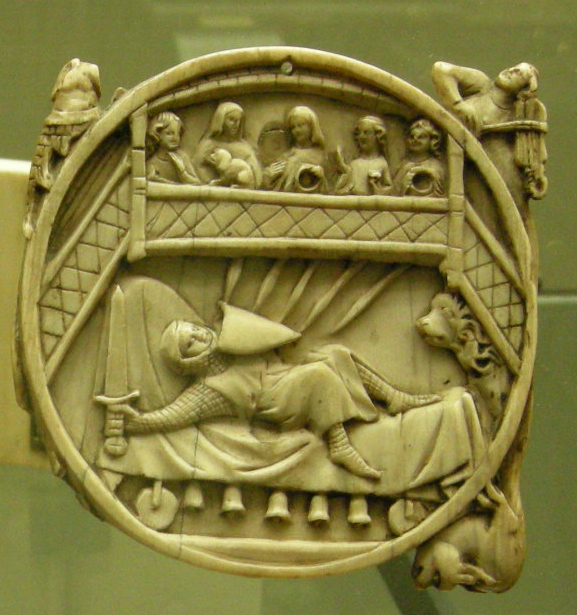 Right: Gawain on the Perilous Bed, on an ivory mirror-case, Paris, 14th century. Attribution: I, Sailko. Gawain is not able to escape the castle before he has suffered several trials and adventures, for it seems that this Grail castle is also the Castle of Wonders, with all of the usual trick furniture, hidden weapons, fiery dragons, lamenting maidens and the whole apparatus usually found in Chastel Merveilleus. He is injured in the shoulder by a lance that comes out of nowhere; despite the loss of much blood he resolves to stay in the castle. After fighting a large and heavily armed knight, Gawain falls unconscious, only to be woken by celestial music. hen Gawain is surrounded by many people, who drag him from the hall and tie him to a cart. He falls asleep. In the morning he is paraded through the streets and pelted with dung and old shoes, before he is driven out of the town. These translations from the Prose Lancelot are by Jessie L. Weston; Sir Gawain at the Grail Castle, Arthurian Romances vol.6, Nutt, London, 1903.